Owners are still renovating The Grocery but already hosting occasional events from exhibitions to performance art. In an old building on a quiet residential street on Beacon Hill, a vibrant new arts center has been setting up shop. For decades, the building on the corner of 21st Avenue South and Stevens Street was a grocery store — an honest-to-goodness corner grocery where longtime neighbors still remember going for cigarettes and penny candy. Although the area is no longer a commercial zone, owners Janet Galore and Demi Raven feel strongly about providing service to the community. Their offerings are art and film exhibitions, musical performances and other creative and activist gatherings. “This place has a history. Keeping the connection of the community with the space is really important to us,” Raven said. “Studies Show: Reality Is Mutable,” cinematic virtual-reality installation by Jacob Fennell, opening 6:30 p.m., Sept 8, installation viewing noon-5 p.m., Sept. 9, 10, 16, 17. Degenerate Art Ensemble and Mizu Desierto, 7 p.m., Sept 23 (sold out) and Sept. 24; The Grocery, 3001 21st Ave. S., Seattle; $5-$30 (thegrocerystudios.com). When they bought the building two years ago, Galore and Raven had been dating for three years and had decided to buy a place together (they are now married). Amazon employees with personal artistic practices (among other things, Galore is a designer and filmmaker and Raven is a painter and musician), they envisioned finding a unique place where they could live creatively. A real estate agent friend showed them the 1929 building, up for lease after a long life as a grocery store, restaurant-supply store and outreach ministry. It was a challenging property, with strict zoning restrictions and a top floor suffering from neglect, nonfunctioning fixtures and a lot of mold. But downstairs — the heart of the former store — was another story. “This room was the star,” Galore says. Thirteen-and-a-half foot ceilings rise above 1,100 square feet of open space. It was full of possibilities and they were hooked. After a year of Raven’s renovations, the space was more or less ready to host events. 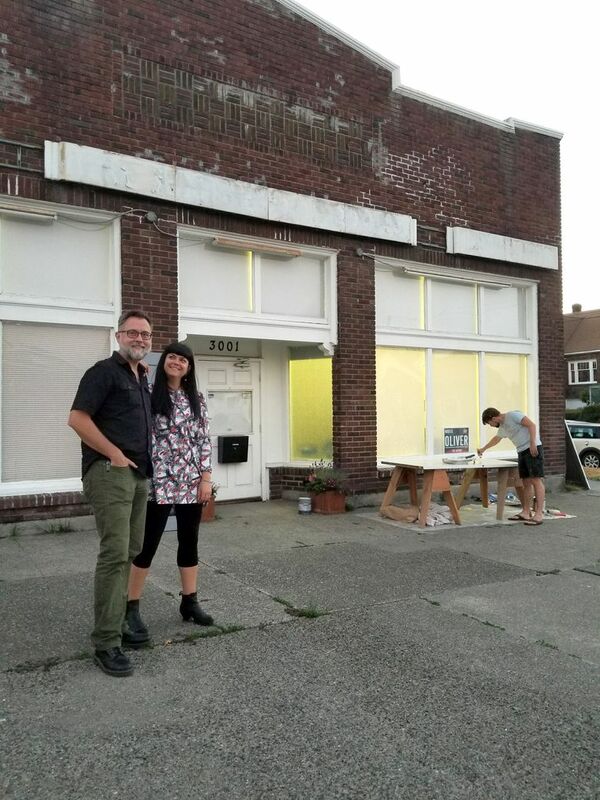 In addition to using it as their studio (and hoping to live there in the future), Raven and Galore now open it up for projects by artists whom they seek out or meet socially, or who have sought them out. It’s an informal process that blends curating and patronage, a process that they expect will become more “intentional” over time. While some artists bring projects that are already funded, all efforts are buoyed by Galore and Raven’s keen support and their generous offers of equipment, space and time. According to Galore, they are slowly configuring a multifunctional space as they “use the events to build the infrastructure for future projects.” They’re even establishing a modest lending library of equipment that they will continue to share with artists and arts organizations. So far, in addition to salon nights and pop-up art exhibitions, they’ve held computer camps for kids, an estate sale of art collected by photographer Arthur Aubry, music performances by Lori Goldston, Tomo Nakayama and others and a fundraiser for mayoral candidate Nikkita Oliver. Some events are free, while others offer sliding-scale admissions. This emphasis on the fluid relationship between art and tech should come as no surprise given Galore and Raven’s backgrounds. “One of our secondary goals is to inspire people [in tech] to create culture, to create something that’s positive and dynamic for a greater benefit,” Raven said.